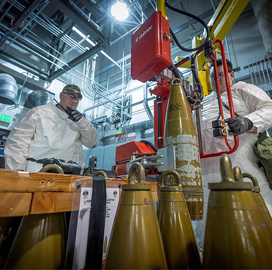 A team led by Bechtel has completed the neutralization of 100K munitions from a U.S. chemical weapons stockpile in Colorado using robotics technology. The Bechtel-led group decommissioned the weapons containing an explosive mustard agent at the Pueblo Chemical Agent-Destruction Pilot Plant, built for the disposal of munitions from the Pueblo Chemical Depot, Bechtel said Tuesday. The team used a robotic system to remotely access the weapons’ interior and drain the liquid agent to recycle the munition bodies. The Pueblo plant processes around 400 munitions a day and has eliminated over 500 tons of chemical agent. "This milestone is a key step forward in achieving our mission here at PCAPP," said Bret Griebenow, a project manager at Bechtel. The team’s work comes as part of a contract with the Department of Defense’s Program Executive Office for Assembled Chemical Weapons Alternatives to address a requirement by the Chemical Weapons Convention treaty signed by over 190 nations. The Pueblo disposal effort is slated for completion in 2023, after which the PCAPP will be closed. Another Bechtel-led team is currently facilitating employee and systems training at the Blue Grass Chemical Agent-Destruction Pilot Plant in Richmond, Ky.